picking away at my 44 French Classics. 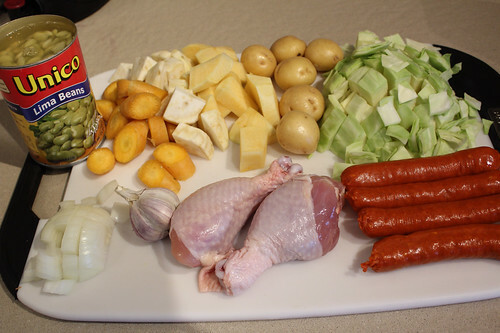 So many of the South-western French recipes on the list are basic stews with varying ingredients. For this next one, I found many recipes of the same name but the meat ingredients seemed to vary. 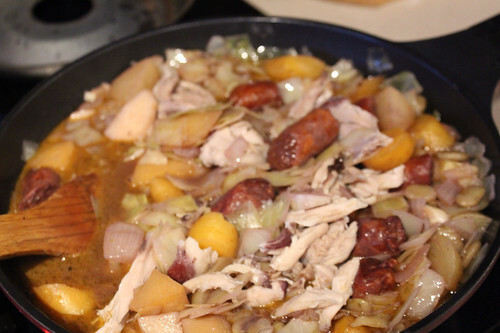 The common elements were duck legs, cabbage, and were heavy on the root vegetables. It’s basically known as a peasant stew. but having no frame of reference I can tell you only that is was a tasty stew. but somewhere there is a legless chicken cursing at me…. In a heavy saucepan heat oil and brown chicken legs. Season well and deglaze with several splashes of wine. Cover the pan, reduce the heat and braise until chicken has cooked through. Remove legs from pan, skin and shred the meat, setting aside. In the same pan (add extra oil if needed) sauté garlic and onion until fragrant. Add Merguez and brown well. Season well again and add the rest of the vegetables (except for the limas) and broth. Simmer until all vegetable are cooked. Return chicken meat and limas to pan stirring until heated through. or break off morsels of bread into the stew and serve.